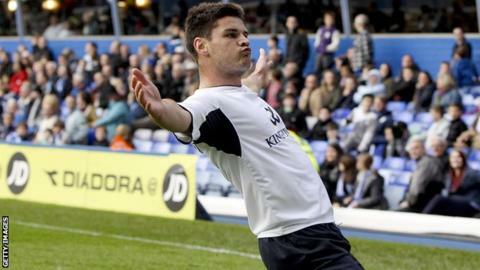 Substitute Ben Marshall scored a late equaliser at St Andrew's as Birmingham failed to win for the fourth time in five league games. The hosts went ahead on the stroke of half-time through Peter Lovenkrands after a cross by Marlon King. And Birmingham looked set for their first home win since 18 September until Marshall levelled for new leaders Leicester with a shot in-off the post. Jonathan Spector was sent off for the Blues in injury time. The result ended Leicester's five-match winning run in the Championship. But the Foxes will be relieved to have escaped with a point, despite being frustrated by 19-year-old England keeper Jack Butland in the first half. The England international produced fine saves to deny Martyn Waghorn and Anthony Konockaert. Birmingham, who included Ravel Morrison from the start for the first time since August, took the lead against the run of play in first-half injury time as Lovenkrands converted a great cross from King for his third goal of the season. Leicester keeper Kasper Schmeichel denied King when clean through yet time appeared to be running out for the visitors before Marshall drew the Foxes level out of nowhere in the 86th minute, his shot from distance going in off the inside of a post. Spector was then dismissed as he was shown a second yellow card, while there was still time for Butland to produce another great stop to keep out Marshall's goalbound free-kick. Leicester manager Nigel Pearson: "Although we didn't start in the fashion we were expected to, the performance against Birmingham was an example of performing well. "On balance I thought it was another fine team performance, but what pleases me most is the unity within the team and squad, and it is there for everyone to see. "We showed some determination and quite a bit of composure to get something out of the game. They broke up the tempo very effectively but all in all my players dealt with the demands of the game very professionally." Birmingham manager Lee Clark: "My players showed a lot of passion, desire, drive and energy and I was hoping they could hold out, but unfortunately it was not to be. "I thought it was a cracking game by both teams."